Royal Gardens in Brussels are a part of the Royal Domain open to the public for a few days every year, and where can be found some remarkable greenhouses. One of them, round in shape, is perfectly depicted on some bottles of Domaine de Calvani 1). 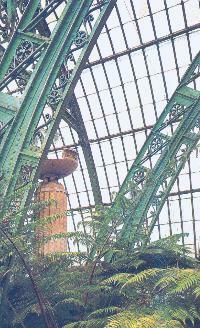 Another is reinforced by metallic girders which are, despite their seemingly unique design, duplicated in the Garden of Philodendrons 2).